Your favorite GoUNLI promos from Globe now with added data bundle and made even cheaper. From the previous GoUNLI500 down to GoUNLI350 with almost the same package, but with a lower price and added 200MB for surfing. That is a huge mark down in price if you want to cut down your communication allowance or budget. The same goes with other GoUNLI denominations, they now have an additional and updated package that you surely love for an unlimited call and text to networks promo. From the lowest amount which is 15 pesos up to 350 pesos with one-month or 30 days validity. You have the option to register on your own by directly texting the keyword to 8080 or you can also use the Globe *143# GoSAKTO menu. Globe Telecom GoUNLI promo is also available at your nearest load retailer, store, and kiosks. Just reload your prepaid account with your desired amount and validity before you subscribe to any of the listed promo below. Dial *143#, select ComboPromos then GoUNLI. Select the denomination of your choice to subscribe. Wait for the SMS notification from Globe about the status of your registration. Just text GOUNLI(amount) send to 8080. How to call Globe and TM mobile number? Just directly dial the 11-digit number of the person you are trying to call. No prefix or code needed to call while registered to GoUNLI promos. How to stop GoUNLI promo? 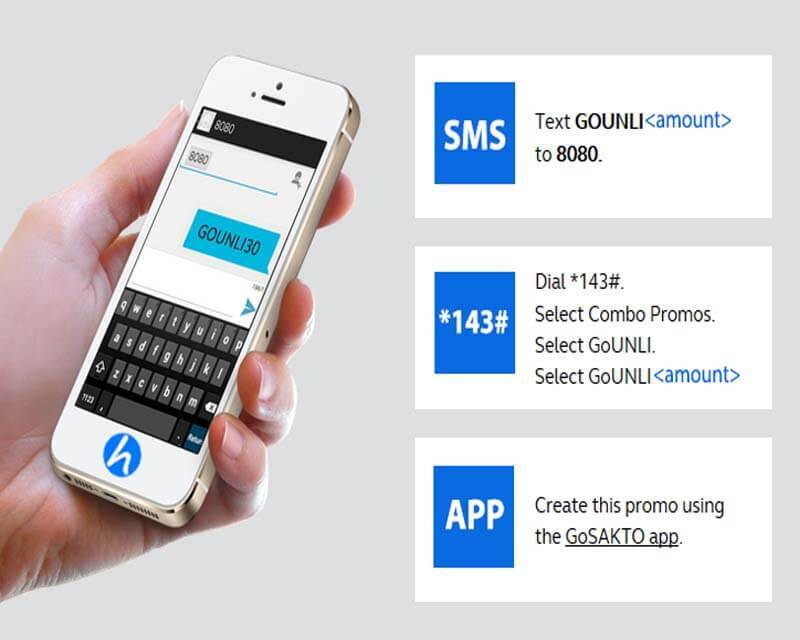 To stop, just text keyword GOUNLI(amount) STOP then send to 8080. You can also navigate to *143# menu to unsubscribe this promo. Make sure to turn off auto updates and restrict background data when using the allocated mobile internet MB’s one each GoUNLI promo to prevent unwanted data consumption. For other Call, Text and Combo Prepaid Promo updates from Globe, you can visit the link provided as your reference.